Making and enjoying a fresh cup of coffee at work can be a very nice perk in helping us get through our day, especially when you are working outside. Most company’s design their coffee machines to be used indoors and are made to sit on a counter-top and stay in one place, portability is not much of a concern. The problem is that many people do not work in one place but still would like to be able to make a fresh cup of coffee. The only option in the past was to take a regular coffee machine and bring it to the job site. 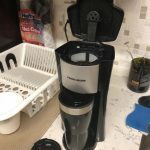 A regular coffee machine will make you coffee but you have to carry an additional water container, they often tip over and get broken rather quickly. They were not designed for rough portable outdoor use. Which is why we wanted to review the OXX COFFEEBOXX Jobsite Coffee Machine today, because that’s EXACTLY what it’s made for. The company that developed the OXX COFFEEBOXX wanted to build a portable job site coffee machine with the construction worker in mind. They came up with a coffee machine that is ridiculously rugged and can take the daily abuse of a being on a job site. Considering it costs about $100 more than a Keurig machine, is the OXX COFFEEBOXX worth giving a try? Let’s have a closer look to see if it’s worth it. The build is what sets this coffee machine apart from any other coffee machine on the market. The overall look is like a small cooler. Everything about the COFFEEBOX is industrial, it is made with a heavy-duty chassis that is impact-resistant, crush-proof and can support up to 1500 lbs. Here’s a funny promo picture from the company, but it doesn’t stop there. It is dustproof and watertight and will not spill under any circumstances. This machine is tough the OXX team did a number of ridicules durability test to ensure a super rugged coffee machine. The COFFEEBOXX weighs 12 lbs. empty and has an onboard water storage tank that holds 2.5 liters or 84.5oz of water. It is the largest self-sealed water reservoir on the market for a portable coffee machine. It will make 10 cups of 8oz coffee or 7 cups of 12oz coffee before having to refill the tank. The top center is where the control panel is located and on the top front is the coffee pod compartment. On the front side is the fold out cup placement compartment. This folds out to allow you to place a cup under the coffee spout. It has a retractable three-foot heavy-duty power cord that tucks away when moving the COFFEEBOXX around. It’s a little short but most job sites have extension cords and more cord would have required more space to store in the unit and would have added to its overall weight. The COFFEEBOXX has six tie-down points. This allows you to tie the coffee machine down when transporting during rough rides. The COFFEEBOXX operates like most coffee machines and works with any single pods and it will work with most reusable cups on the market. To make a cup of coffee, simply turn the machine on, open the flap on the top above the cup dispenser and place in a coffee pod. Located on the top center console are large dustproof and waterproof rubber buttons sealed to IP55 standard. Specifically designed for big dirty fingers. The Machine Alert Status will let you know there is an error with the water supply. The three red indicators will begin flashing The top is the heating indicator lets you know when the unit is heating water and when it goes out you are ready to brew. The second indicator is the refill light this lets you know when you have to fill the onboard tank with water. The final light is the descaling indicator. The Descaling indicator light turns on when the coffee machine needs descaling this will be about every 3 to 6 months depending on how hard the water is in your area. Another indicator when descaling is necessary is when the coffee machine makes a lot of commotion of steam and sputtering and takes longer to produce a cup of coffee. Descaling will remove lime and calcium deposit build up in the machine and keep it running longer. I know at home I like to run my water through a Brita water filter before making coffee it takes the chlorine taste out and makes a better cup of coffee. The COFFEEBOXX has a water filter onboard and you only have to replace the filter every three months. Replacement filter cost only around $5. 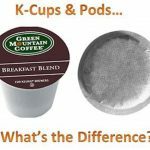 If you like tea or hot cereal the COFFEEBOXX has a separate line for dispensing hot water and another line that goes through the coffee pods. 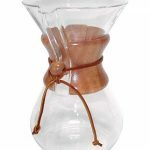 This ensures clear tasting hot water that has not gone through the coffee mechanism. The price is about double a Keurig coffee machine but I think the COFFEEBOXX will easily outlast the standard coffee machine. If you take minimal care of the machine and perform a descaling every few months this coffee machine would last years. The only thing I could see ruining the COFFEEBOXX before its time is if it is left out in the cold, below freezing temperatures will freeze the water inside the unit and cause some of the inner hoses to break or plastic reservoirs could crack. Don’t leave the COFFEEBOXX out in below zero temperatures. For added value, if you are a contractor you can take it with you on camping vacations and use it to make coffee, tea, hot chocolate and cereal or use the hot water to do dishes. The COFFEEBOXX is an excellent coffee machine to go camping. A good accessory to get is their COFFEEBOXX Field Case. This case protects and keeps the COFFEEBOXX clean. It also comes with two pouches, one for coffee pods and additional pouch for condiments like cream and sugar etc. to keep things clean and organized. Having the ability to brew coffee on a job site is a wonderful thing. Not only does a cup of coffee cost less but you can also keep all your workers on the job site and no time is wasted getting coffee. The hot water can also be used for tea, ramen noodles, hot cereals and any number of things that can use hot water. I think the OXX team created exactly what they set out to do and made a bulletproof job site coffee machine. The extra durability, retractable power cord and the addition of an onboard water tank make the COFFEEBOXX a truly portable unit. It is very easy to move around and operate; all you need is AC power and your favorite coffee pods. The price of the COFFEEBOXX is comparable to a premium coffee machine. They do go on sale for as low as $150; at that price, it’s a real bargain. This coffee machine is built very solid and is designed to quickly and easily make a hot beverage anywhere. There are a few other portable job site coffee makers on the market for less money but they are not as convenient to use and do not have as many features, or even come close to being as tough. The large onboard water tank sets the OXX COFFEEBOXX apart from its competitors making it a great choice for a job site coffee machine. The OXX Company stands behind their product and with regular maintenance, the COFFEEBOXX should last a number of years and keep a large work crew happy.